The past month, there have been few easily picked cherries for open source analysis. If you must read down, I have a short list of succinct predictions. Much of the geopolitical commentary of the open media is at odds with my analysis, but it does not sum to an urgent conclusion. I’ll write on this in coming days. So this is an opportunity to offer visual contemplation on the continuing plight of Humankind, who come in various varieties. One of these is Spaceman. The metaphysics/physics behind it is this. 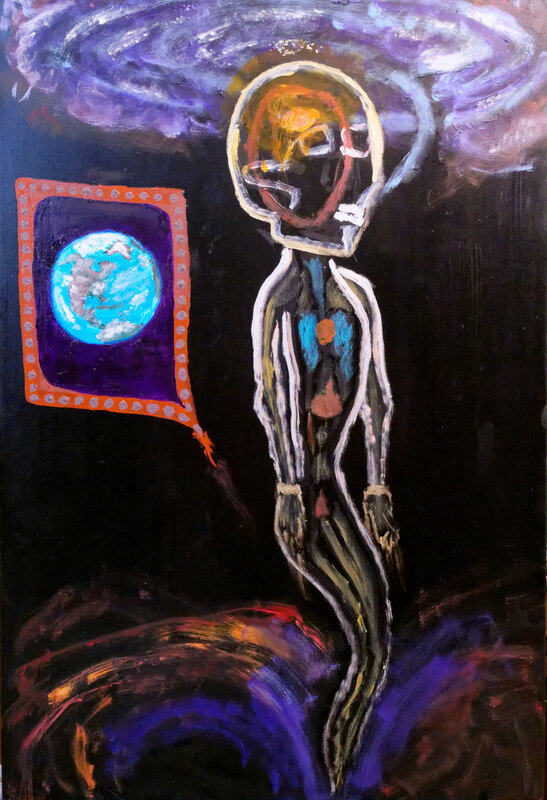 Spaceman’s head reaches for Cosmic Consciousness of a spiral galaxy. But sadly, he is being sucked into a black hole. As he approaches the event horizon, the gravitational field varies strongly with distance, the so called “tidal forces” causing the elongation and dissolution of his lower body. At the event horizon, the very atoms are torn asunder and with it, his memories of Earth, visible in the steam-punky porthole. Perhaps, as Spaceman contemplates his predicament, his memories of Earth romanticize the current reality. 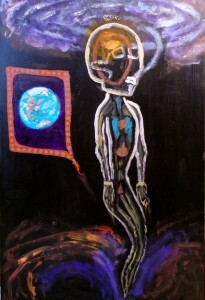 The painting is an invitation for you to replace the generalized likeness of Spaceman with your own. Do you identify with Spaceman? There are other types of human beings. Hillary Clinton will win the election. Economic recession in the U.S. will be identified, by the traditional standard of two successive quarters of contraction, in late 2016 or 2017. Mosul will be taken on schedule. The Obama Administration is now fully engaged with the problem of ISIS. The Afghanistan situation will continue to deteriorate. As ISIS disintegrates as a quasi state, the energies it absorbed will be subsumed by other organizations. Some, such as Al Qaeda and the Muslim Brotherhood, already exist. Others will spring into existence. Conflicts in the Middle East that previously occupied our attention will acquire renewed energy. But if you’re Spaceman, you’re above all this. Find your happiness wherever it may be.